OBITUARY, July 26, 2018 – Sergio Marchionne, the Italian-Canadian accountant whose savvy deal-making rescued both Fiat and Chrysler from the brink of bankruptcy, died on Wednesday in Zurich. He was 66. Born in Chieti, Italy, he was 14 when the Marchionne family moved to Toronto. Raised in the working class neighbourhood of Keele and Wilson, he used his certified general accountant and chartered accountant designations as a passport to a global career, becoming one of the most recognizable and lauded corporate executives in the world. As head of Fiat Chrysler Automobiles, Ferrari and Maserati, Marchionne was a workaholic who chain-smoked Muratti cigarettes, drank copious cups of espresso and often slept en route in his private jet from Turin, Italy to Detroit and London. The rumpled, permanently jet lagged executive wore a black sweater and jeans to work every day, claiming that choosing suits was a waste of time. 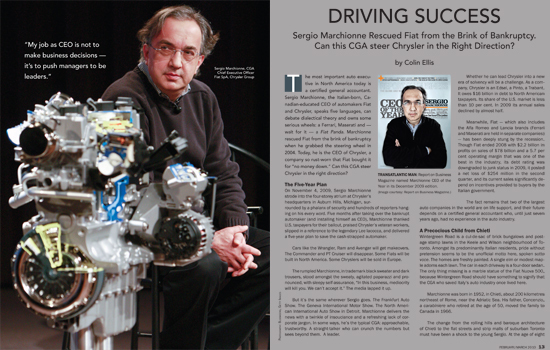 Driving Success, a profile of Sergio Marchionne in Statements Magazine, 2010 by Colin Ellis. In many ways, Marchionne was the epitome of the Chartered Professional Accountant brand now promoted in Canada, with its emphasis on navigating disruptive change and “driving” success through one’s skills as an accountant. In person, however, Marchionne was the antithesis of the polished accounting executive with a “personal brand.” A tall man who appeared smaller due to his stooped posture and crossed arms hugged to his chest, he could be disarmingly funny and liked to mix lyrics from pop songs with quotes from Nelson Mandela in his speeches. As detailed in this profile (“Driving Success”) I wrote of Marchionne in 2010, he spent his twenties sweeping up academic credentials (B.Com, MBA) and professional designations (CGA, CA, LL.B). Marchionne spoke highly of his accounting designations when he received his certified general accountant fellowship in 2011. He praised his CGA designation for its focus on business management, adding that he gained his knowledge of tax law while working for Deloitte & Touche, where he completed his chartered accountant designation. 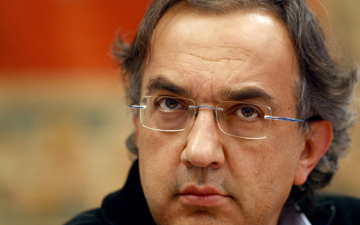 A series of corporate moves made Marchionne the right man in the right place at the right time on numerous occasions. In 1985, he joined a Toronto-based packaging company called The Lawson Group as its chief financial officer. When Lawson was acquired by a Swiss-based company, Marchionne rose to CEO, then jumped ship to SGS Group, owned by the legendary Agnelli family of auto racing fame. The Agnellis were so impressed by Marchionne they made him CEO of Fiat, at a time when the company was facing bankruptcy. Marchionne turned the company’s fortunes around, earning him numerous auto industry and business executive awards (see “Driving Success”). In 2009, with the U.S. reeling from the Great Recession and Chrysler on the brink of bankruptcy, Marchionne struck a tough deal to buy the automaker and merged it with Fiat. Marchionne had a legendary reputation for being tough on executives. He took a blowtorch to the staid management of Fiat and Chrysler and often promoted junior management to top positions. He expected top executives to work as hard as he did but was well known for his accessibility, and emphasis on open rather than hierarchical management structures. Marchionne returned both Fiat and Chrysler to profitability and repaid bailout loans (with interest) from the Ontario and federal governments in 2011. Ever the numbers man, he revealed that Chrysler could save $350 million annually in interest by replacing the loans with borrowing at cheaper rates from large institutions such as pension funds. As a measure of Marchionne’s impact on the business world, news of the Canadian accountant’s death appeared in business publications around the world. His contribution was acknowledged by auto industry leaders and politicians in many countries, including Apple CEO Tim Cook, U.S. President Donald Trump, and Prime Minister Justin Trudeau. Marchionne leaves behind his estranged wife, Orlandina, children Alessio and Tyler, and partner Manuela Battezzato. Colin Ellis is the managing editor of Canadian Accountant. Read "Driving Success," which won the 2011 Kenneth R. Wilson Award for Best Profile of a Person in a Canadian business (B2B) magazine.